The WCRDE is an internationally renowned accreditation and membership organization for individuals, schools, institutions (colleges), universities, publications & regular, open & distance education community. WCRDE is supporting all Government Education Systems, Norms, Regulations and Code of Ethics. To promote individuals, schools, institutions (colleges), universities, publication and Regular & Distance Education internationally & take whatever measures are necessary to this end. To promote educational contact between all Universities, schools, institutions (colleges) and all publications electronic and print media. 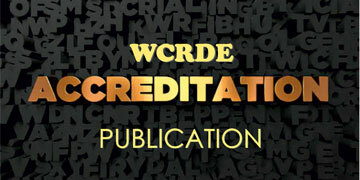 WCRDE Publication Accreditation are grouped by country wise. Copyrights © The World Council for Regular and Distance Education - WCRDE 2012 - 2019. All Rights Reserved.Powered By: BukTel Technologies (A Venture of SE Cards India Ltd).